In a lot of ways, I feel like Rodger Wilco. The one guy with so much going for him, but it's always the little things that happen that make things a pain. However, the game wouldn't have worked if it didn't happen this way. Unlike the other Sierra characters, Rodger built up his dorkyness instead of being an instant dork like Larry Laffer. Mark Crowe and Scott Murphy teamed up again to bring us another title in the series. 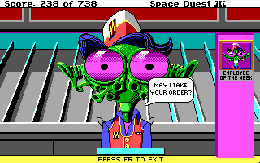 When people discuss the Space Quest series, there seems to be a heavy falling out on what the best Space Quest adventure game was. A lot of people fight between 4 and 5. 4 was a huge achievement in terms of graphics and overall wacky storyline but 5 felt to me like a Star Trek game with comedy tacked on. What I don't like is that Space Quest 3 rarely ever gets a mention. So I put a stop to this now! This is clearly my favourite game of the series and I will explain why. Back when I owned an XT, it was kind of limited as to what you could find that would run on an EGA card and for something to look and play this impressively was unheard of at the time. The text input is still my personal favourite as it allowed you to try different things and often this would get amusing results. This game shines in presentation, with its huge graphics and charm. Remember that this is only 16 colour EGA. Many sites are reporting that it's actually 256 VGA, which is not true. What is more amazing is that Mark Crowe co-wrote the game and also did ALL of the graphics and animations. This is nothing short of greatness! You start the game off in the junkyard where you see tonnes of spoofs such as a crashed Tie-fighter and some Transformer references. There is even Lego in the junkyard and probably some other old school toys I have never seen before. That's what made this game great; the whole take the piss out of almost everything in society. It's kind of the way South Park works today. Tie-Fighters and Looney Tunes inventions what more could you want. I love how Rodger looks behind like a trucker. As I was using an XT when I first played this game, I was limited to playing this game using the PC speakers only. 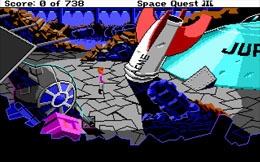 This was the first Space Quest game to offer AdLib and other high end sound cards at the time. Now I get to hear what I was missing. It is almost a perfect use of midi music and midi sound effects. It feels correct for the Space Quest universe and hearing the theme song without PC beeps for the first time was awesome! The sound effects using the AdLib cards added to the humor as well, such as, the rail cart machine making a reversing noise when you went backwards and for there only being one cart and one rail I found it funny as hell. It's the little details that make you love this game. This is what Macca's would be like in the future with on site parking? Are they taking the piss that there are no premade burgers ready and only one employee? They have happy meals at least. Dying in this game is sometimes funnier than actually playing the game properly; sometimes you will try something and the game acts amazed that you had even thought of it. Like in the rail cart I tried jumping out when it was moving and it goes, "I wouldn't do that." What I found great was the use of mini games. 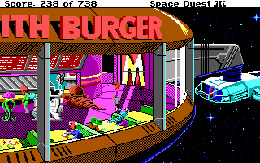 This set the standard for Space Quest games after the third game. Astro Chicken was almost as popular as the whole game itself and even served as a hidden message if you beat the mini game. Without giving too much away, there is a scene where you battle with rather poor performing robots. It was as if Mark Crowe and Scott Murphy were taking the piss out of games such as One Must Fall 2097 or Rise Of The Robots. But none of these games were out then so I don't know if they were future proofing the game or not. They must be proud of that now. I know I rave on about this game, but what are the bad parts? The fact that the game is fairly easy makes it a short lived adventure. However, it seems to remove the truly frustrating moments of the previous games, such as bad timing bugs annoying walking sections (the forest fruit level in Space Quest 2, anyone?) and leaves a more enjoyable after-taste as well as the points system which was always a great way to encourage further play after conquering it. Sure it would have annoyed people who paid full price, but once the collections came out no one would care anymore. I loved every minute of this game and if you haven't played it in years or have never even played it... Load up DOSBox and enjoy! The overall charm, comedy and fun makes this a master achievement and I miss these games more as time goes on.